Everything is going right for the company, and expectations have reached the stratosphere. Shares of graphics chip company NVIDIA (NASDAQ:NVDA) have soared 65% year to date, according to data provided by S&P Global Market Intelligence. This gain is on top of a 224% rise in 2016; it continues an explosive run driven by strong results in the core gaming business, as well as rapid adoption of the company's products for both artificial intelligence workload acceleration and the development of self-driving cars. The core gaming business, responsible for more than 50% of total revenue, continued to grow quickly, driven by strong sales of NVIDIA's GTX 1000 series graphics cards and the company's Nintendo Switch design win. The gaming segment produced $1.03 billion of revenue during the first quarter, up 49.5% year over year. While the gaming segment posted impressive results, the performance of NVIDIA's data-center and automotive businesses likely drove much of the euphoria from investors. First-quarter data-center revenue soared 186% year over year to $409 million, with NVIDIA's enterprise graphics cards accelerating an increasing number of workloads. The automotive segment also reported solid growth, with revenue up 23.9% year over year to $140 million. Major automakers including Toyota, Audi, and Mercedes-Benz are using NVIDIA's Drive PX platform to develop self-driving cars, and every vehicle that rolls off the line at Tesla now includes NVIDIA's Drive PX hardware. NVIDIA's continuing dominance of the gaming GPU market, coupled with the growth potential of the data-center and automotive businesses, led investors to send the stock soaring since the start of the year. NVIDIA's Tesla V100 data-center accelerator card. Image source: NVIDIA. NVIDIA is now valued at around $100 billion, about 14.5 times sales and 65 times earnings. Both revenue and earnings are growing quickly, but the expectations of investors have reached monumental proportions. NVIDIA faces plenty of risks that could derail the company going forward. Advanced Micro Devices is set to launch new high-end graphics cards in the next few months, potentially winning some market share. NVIDIA's stranglehold on the artificial intelligence acceleration market could be jeopardized by specialized AI chips, like Google's Tensor processor, supplanting graphics cards. And competition in the market to provide the brains behind the self-driving car of the future may prevent NVIDIA's solution from becoming the standard. 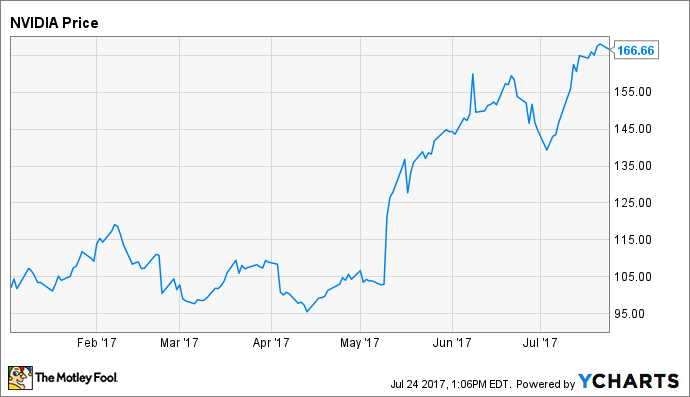 NVIDIA stock has had an incredible run, but a lot has to go right for the gains to continue.